S-shaped airlocks are the "OG" airlocks for home beer and winemaking. They make it easy to spot fermentation activity, and have no loose peices to lose. 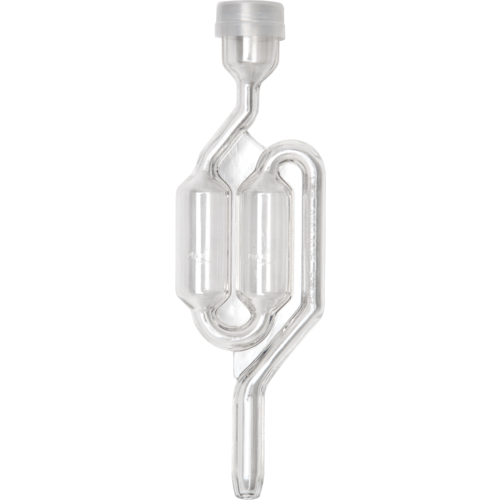 The advantage of this type of airlock is that they have a smaller chamber so you can more closely observe the CO2 rising and therefore the rate of fermentation. They are also handy when you are cooling a beer as there is less chance of sucking airlock water back into the fermentation. They cannot be cleaned manually if they get dirty during the ferment. That is why many homebrewers prefer 3-piece airlocks for the active portion of the ferment, when the krausen (foam) from fermentation might be pushed up into the airlock.